Luccia Alimenti, daughter of a medical professor at the University of Salerno, Italy, destined to carry ancient texts and herbal lore into the dangerous and groundbreaking future. 1. Luccia, the protagonist, goes through several stages in her life, almost morphing into different people. Which one was most appealing to you? 2. One of the author’s objectives was to dramatize the conditions – and the stereotypes -- surrounding the witch burnings in Europe, including the seizure of women on the road, the targeting of women with wealth, the connection between the witch burnings and the plague. How many of these were new concepts to you? 3. What did you think of Luccia’s romantic relationships? Between Jacqueline, the Bowman, and Paracelsus, which seemed to be her greatest love? Which one did you appreciate or identify with? 4. One of the key themes of the book is the interplay between visibility and invisibility. Where is this a dramatized? 5. Another key theme is the idea of external power and internal weakness and vice versa. Who personifies this theme? Where is this dramatized? 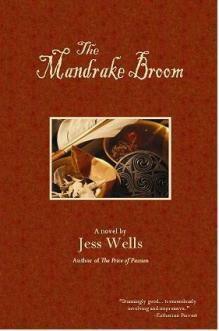 How does the title The Mandrake Broom exemplify this theme? 6. Why was the invention of movable type such a watershed moment in this story? How did it change the power balance? 7. The Hammer of Witches is an actual book, written by the characters described in the story. Had you ever heard of this as a manual for persecuting witches? 8. This book is set in the period when medical knowledge was being wrested from the hands of female midwives and herbalists, given to men in newly-formed universities that focused on surgery. Is the battle between herbalism and surgery still raging? Are there other parallels with modern times? 9. Luccia is astounded when she sees herself in a full-length mirror for the first time. Can you imagine what it would be like to see your entire body in an accurate mirror for the first time ever? 10. There are a number of details on how things are made or done in the Middle Ages: how arrows were made, how herbalists gathered their crop, how doctors battled the Plague. Discuss the details of medieval life that most interested you. 11. Which were your favorite characters? 12. What did you think of the ending?